Before I go to bed I wanted to remind everyone of the Stampin' Up!™ Retired List. Click on the link below to see the stamps that will be gone after December 31st! Download US_Wrapping_Flyer_1107.pdf There are some great discounts you can contact me to order. 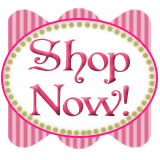 You can email me at carol@carolpaynestamps.com or call my cell: 618-237-6281. Contact me anytime between now and December 30th to take advantage of any of these great specials! Remember, anytime you purchase a gift certificate, it will arrive in a gift card holder similar to the ones shown in my previous post! Have a great weekend! Stamp something good! Sometimes when I sit down to create a project, I have a picture in my head of what I want to do, but I don't always get what I want! This first card is that way. My daughter, Jessica, took our family picture on Thanksgiving, so I had her print a bunch of wallets so I could create our family Christmas card around it. She edited it with a cool action called "Chocolate Sepia" (I think! sorry J if that's wrong!). At first I thought I would use Bordering Blue and the Flannel Plaid Background, but the result just looked faded and blah. (Even though I've been a demo for 5 years, I still turn out a dud now and then!) So I tried a again and I think I nailed it this time! So what do you think? After seeing some of the ornament cards I've made tonight, Mark (my DH!) 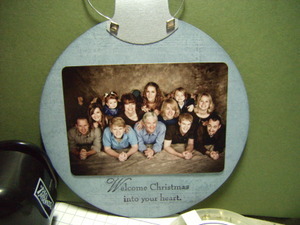 suggested I make our family card into an actual ORNAMENT that can be hung on the tree! How cool is my hubby! 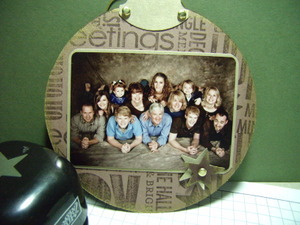 I switched to Close to Cocoa cardstock and used the All About Christmas Jumbo Wheel in Chocolate Chip. I used Brushed Gold cardstock and Encore Metallic Gold ink. I finished it off with gold brads and the star punch again. I sponged the edges of the Chocolate Chip star with gold ink before I layered it on top of the gold star with mini-glue dots. It will take some time to make over 100 of these, but it will be worth it! ©1990-2007 Stampin' Up! ™ Please let me know what you think by leaving me a comment! I can't wait for my Spring/Summer 2008 Collection pre-order to arrive! Demonstrators get a special sneek peek and get to pre-order from all catalogs and minis a month early. I ordered a LARGE STAR punch along with a bunch of other cool new stuff (and the stamps were an extra 15% off just for us! ), so I can't wait! I have had several requests lately for gift certificates/gift cards, so I knew I wanted to make holders for them. 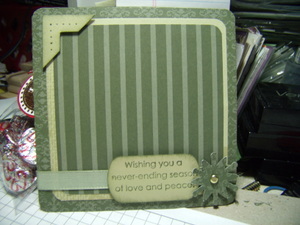 I found this cool pattern to make this tri-fold gift-card holder and went to work! 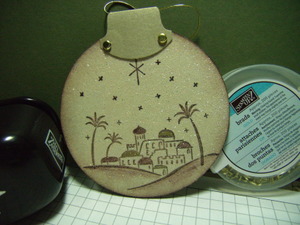 It's had to tell in this picture, but I stamped Sanded Background in Chocolate Chip in on the Chocolate Chip cardstock. I sponged Chocolate Chip ink on the edges of the Outlaw Double Sided Designer Series Paper . I also sponged ink on the edges of the Star Punch ed stars. 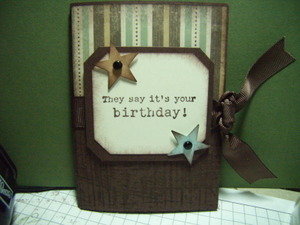 I used black Vintage brads and Mini-glue dots tp accent. I finished this off with some 5/8" Chocolate Chip Grosgrain ribbon. I'm hoping the lady I made this for likes it! This is the inside of the other one I made for her. I'm not showing the outside yet, I need to keep something a secret, don't I? 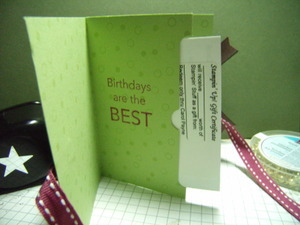 The pocket to hold the gift certificate was made using the Word Window punch and the 1/2 inch circle punch. 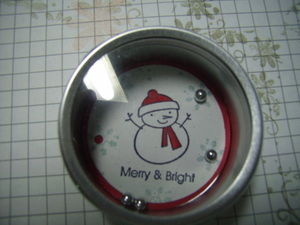 This holder is stamped using the Hot to Dot wheel, which is shown in the index section of the catalog on page197. Since this is another birthday gift, I used another stamp from It's Your Birthday. I can't wait to make a Christmas gift card holder! 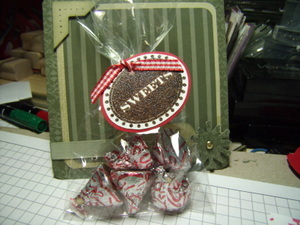 This little yummy candy bag is topped with a tag stamped with Sweet Sampler. Believe it or not, the "Sweets" image is stamped with chocolate embossing powder! If you are interested in finding out how to do this awesome technique, call me at 618-237-6281 or email me at carol@carolpaynestamps.com to RSVP for this Thurs or Fri night! The fee is $20 for 6 projects! I still have space each night, but the limit is 10 per session! I made this coaster frame to be mailable or to put on your fridge door. I used the now expired Holiday Harmony Designer Series Paper, along with River Rock cardstock and Always Artichoke Classic Ink. The verse is from the now retiring In My Thoughts and I really like the look of the Snow Blossom Punch after I punched it in the Holiday Harmony Designer Paper and added a gold brad. I added embellishments with the Photo Corner Punch and Mellow Moss Taffeta Ribbon, then a little bit of sponging and paper piercing complete the finishing touches! Stamp a Stash of Stocking Stuffer Stuff! What is this? It's a cute little game we are making this Thurs, Dec 6th and Fri, Dec 7th, 6 p.m at my house! I promised everyone I would post my projects here this week, and I'm doing my best to keep my promise! This 'bb" game uses the just expired Holiday Mini catalog set, Merry & Bright. I sure hope we see him again in the Fall/Winter 2008 Collection that will come out next July 1st, but even if he doesn't I have had so much fun stamping lots and lots of my stamping projects with him these past few months! 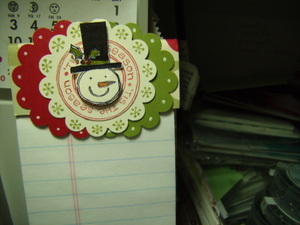 This cute little Punch Pals guy is the topper for a notepad. The bottom pages are stamped with the same set as well!